Since 2011 The Creatives Project has provided studio space to working artists through its Artist-in-Studio program. As the 2013-2015 studio residents prepare to take their experiences at The Goat Farm Arts Center on the next phase of their artistic journeys, a new crop of talent is ready to move in. TCP welcomes its largest group of studio residents yet as the 2015-2017 group (Joseph Dreher, Shanequa Gay, Rachel Garceau, Meta Gary, Margaret Hiden, Meredith Kooi, William Massey, Scott Silvey and John Tindel) gets creative in its new studio spaces. As they prepare to move in, each new studio resident discusses how this opportunity will help them creatively and professionally. How will becoming a TCP artist-in-studio most benefit you as an artist and professional? As a TCP artist in residence, how do you plan to utilize this opportunity? How will you represent TCP? What personal projects do you have planned to complete during your residency? Over the past year, since moving to Atlanta, I have shifted time spent in the studio to mostly make commissions and run production of utilitarian wares in order to make ends meet. Being freed from this constraint will allow me to get back to making the work that I am driven to make—sculptural, installation-based work. I plan to use this opportunity as an educational platform to encourage younger artists, especially girls, to explore and experiment with new media, performance, and other “non-traditional” mediums. I hope that in some way I can be a proponent for new media and transmission art work that is critical of itself and committed to complicating codified gender roles in artistic practices. I want to create like I have never before. Break my boundaries and open up new ones. I will use my studio as a place that I can show my progress, thoughts and work to others. Broadcast from a beacon that creativity is forming and coming alive from myself, the goat farm and TCP. I want to also be influenced. By the amazing artists that TCP has allowed to come together in this way. We have the opportunity to explore the diverse corners of all types of arts.I’ll tattoo TCP on my forehead… maybe. I want to help TCP grow, educate and inspire the upcoming generations. I want to let my “art world” know that TCP gave me a chance and a studio. I want to create work inspired by this experience. I will let everyone know that TCP has given me 2 years to create and during those two years, TCP will be in all my promotion and work. Do you anticipate collaborations with the other studio residents? How important do you think programs like this one are to the creative process and the local art scene? Studio space can be hard to come by and, for me, not possible to fund. It is great that a program is set up to facilitate artists with their general process instead of merely funding specific projects without considering space requirements and conditions. Having a studio is an important factor that allows experimentation to flow. Programs such as TCP are undeniably vital. It is far too common for artists to feel undervalued, under-resourced, and unsupported. When this happens, the culture of a specific place suffers. The Creatives Project completely diminishes those notions and actually reverses them. Through its Artist-In-Residency program, The Creatives Project has provided places for up-and-coming local artists to literally live and breathe their creative processes. TCP proudly announces its newest group of resident artists, Spencer Murrill, Megan Mosholder and Namwon Choi. As they get settled into their new roles as resident artists and Community Arts Program mentors, the trio shares its thoughts on how TCP will help them achieve their creative goals. 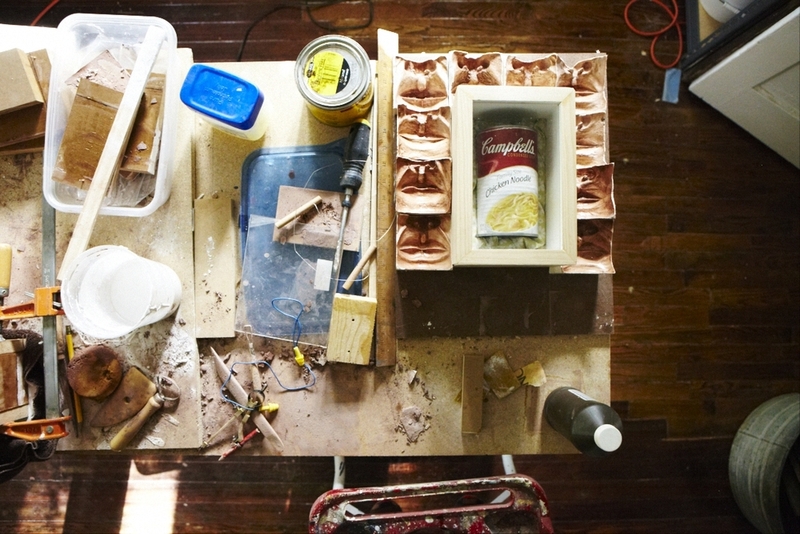 How will becoming a TCP artist-in-residency most benefit you as an artist? Namwon: The time immediately after graduate school is a crucial time for an emerging artist. The artist discovered his/her voice, but if he/she doesn’t continue to develop, the voice is lost. As becoming an artist who does not settle for nostalgia of the painting’s tradition and as someone who is early in her career, I am perfectly positioned to take full advantage of all TCP artist-in-residency provides. The history of painting is a source of knowledge that can be used to create something new. TCP artist-in-residency provides the physical, financial and temporal space to push the development of my voice. Megan: I believe that there is strength in community. Being a TCP artist ensures that I will be more closely united with the Atlanta artist community and through that network, my practice will be nurtured and have space to grow. Spencer: One of the primary challenges for a working artist is to acquire the time, money, and space to make their work. The TCP residency program provides very affordable housing which relieves me of a lot of these pressures. The other component of TCP that I am excited about is involving myself with the larger art community in Atlanta. Working independently for long stretches can be very isolating, and I intend to become more involved with a growing community of interesting people. As a TCP artist-in-residency, how do you plan to utilize this opportunity? How will you represent TCP? What personal projects do you have planned to complete during your residency? Namwon: During my TCP residency, I would like to further my exploration in self-portraiture. I have found cross culture and cross history, there seems to be a difference between commissioned portrait and self-portrait. The artist in self-portrait is metaphorical; sacrificing the real to show what is true. I intend to document the evidence of my existential journey by assembling paintings of close-up images of the skin of underappreciated body parts, especially my hands and feet with studio objects. I will also be focusing on generating new and original work and engaged in a contemporary dialogue with peers and also making connection with network of professionals to share my findings and in progress work with local audience. Megan:I have been fortunate enough to not only receive studio space through the TCP residency program but also a living space as well. Moving into the city will allow me to more easily attend art shows and spend time with other Atlanta creatives. After living without a studio space for the past year, I cannot wait to get into my TCP studio/home and get to work! One of the ways I hope to represent TCP is through community outreach: I look forward to working with Atlanta’s youth and encouraging them to use art as a way to express themselves. Some of my personal projects include a new series of paintings that I have been dreaming up but have not had the space (until now!) to create them. I am also interested in exploring new, different and permanent materials with the intention of building future large-scale, permanent public installations. Spencer: The biggest step for me as a TCP resident is to start educating. I've always been interested in teaching and youth outreach is a great place to start. I am also in the process of putting together several workshops for adults. Gallery exhibitions, public art, and puppet theater are my areas of focus creatively right now. I am equally passionate about all three, and although they seem disparate, what I learn in one area always informs what I am capable of in another. I'm hoping to utilize what I can learn from others involved in this project as well. The projects I am working on now are my first solo gallery exhibition, a proposal for a public sculpture, and a short piece for a variety puppet show. 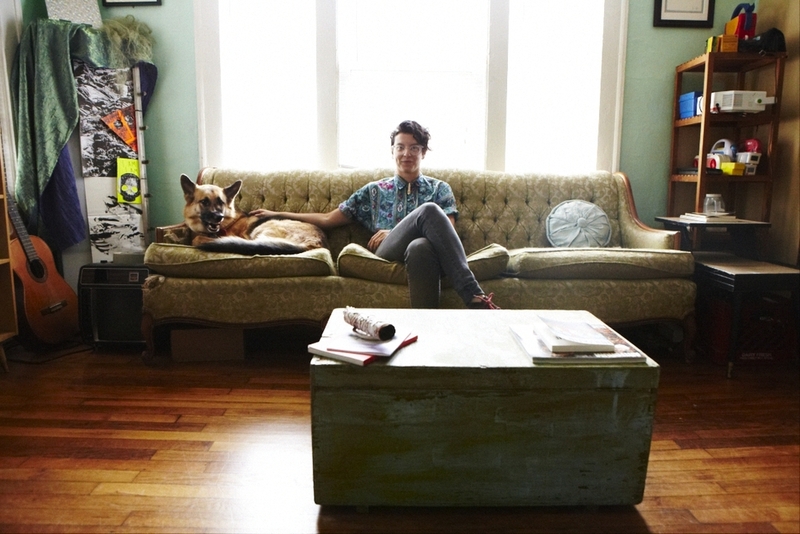 What do you know about the other artist-in-residency? Do you anticipate possibly collaborating artistically since you'll be sharing the housing space? Megan: Collaboration is always an option for me. When you look at artists throughout history, they were always talking, working and collaborating, whether it was the creation of a new manifesto or simply influencing one another’s body of work. I do not know much about the other residents but I look forward to working with and learning from them. Spencer: My future roommate Megan Mosholder has a lot of experience in the gallery and installation realm. Much of her work is site-specific and ephemeral. It seems to have as much to do with light and space as it does form. My work has mostly been about bending the more traditional formats of object-making and graphic design. I think there will be a mutual benefit technically and artistically to us living together, and I have a few ideas about collaborating with her style that I think could be very interesting. Namwon: I found myself most productive when I empty my creative vessel in order to fill it with new experiences and challenges. To let my creativity flow, the knowledge I have acquired through my studio practice must be shared. This process clears my mind for the next inflowing innovative ideas for my art to come. The meaning of the word, ‘teacher’ in Korean is she who learned ahead. The TCP Outreach program is to fill in the gap between local artists and the local audience those who in need of artist as educators. Megan: I think residency programs are hugely important over all because they give artists time and space to work and think but also they give artists a sense of community. Without residencies I would feel very lost, alone and misunderstood. Residencies have not only nurtured my practice but my sense of self as an artist. The overall network I have developed as a result of my residency attendance has given me some of the strength I have needed to preserver in this very difficult state of establishing my emerging career. Spencer: Building a career as an artist can be a difficult process. It is oftentimes difficult to know how to market oneself and what opportunities to invest time into. I consider programs like TCP to be a gesture that a lot of obscure emerging artists benefit from. It allows entry into a community that supports them, and gives them a chance to give back. Being away from the protective incubator of college and off on your own chasing down work it can be a challenge. Programs like this remind me that people do care about art, what I can bring to it, and that the energy I put out always comes back in the best way. The Creatives Project doesn't let tragedy stand in the way of its creative process for long. It struck not long after TCP announced its 2012-14 residency recipients when the Captiol View house that was to serve as an expansion of the residencey was lost in a fire. While all of TCP's residents were affected by this loss, they all prospered through this adversity. Andre Keichian was provided with a subsidized apartment thanks to TCP patrons Edward and Liv Nyankori who came to the rescue, Masud Olufani optimized space at the Elbert House provided by Pohl Real Estate after Gyun Hur was offered an amazing professional opportunity in Hong Kong, and Charlie Watts elected to receive free TCP studio space at the Goat Farm Arts Center. As Keichian and Olufani complete their residencies, TCP will select two new local artists to receive subsidized housing beginning this fall. Keichian and Olufani will host an open house and Q&A with application finalists in late July (stay tuned) and will be exhibiting works they created during their time nesting with TCP at CONTINUUM, TCP's Annual Exhibition and Fundraiser on Oct 10th. But before they move on to other creative processes, these two artists answer a few questions posed by The Creative Process. Andre Keichain's living room in the Metropolitan Apartment. In what ways has this residency helped to strengthen your career as an artist? Andre: My TCP residency has offered me several different branches of development. One is through the experience of teaching and working with fellow artists, which expanded my artist community and helped developed an already existing interest in early childhood art education. The second is through the subsidized rent, which alleviated some daily economic pressures and allowed for more time to focus and invest in my practice. Thirdly, I now have a better insight on how to potentially develop arts advocacy programming, and I’m excited to see how this may influence my future endeavors. Masud: The TCP residency has provided me with a safe stable environment in which to explore my ideas. It has also served as a community of support comprised of arts professionals who have served as touchstones of inspiration. The residency also facilitated opportunities for me to exhibit my work in the Atlanta community which in turn increased my visibility as a working artist. Masud Olufani in his living room at the Elbert House.What is your apartment/house like and have you enjoyed it? Andre: I really love the space I have been living in. 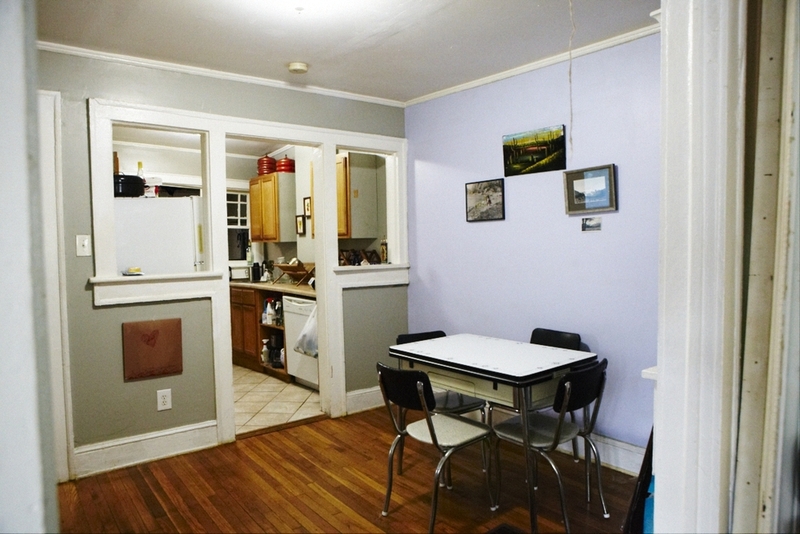 It’s a one-bedroom apartment that is part of a quadraplex, surrounded by good neighbors. Some I have a closer relationship to than others, but they have always made me feel safe. I have painted the walls of my apartment the colors of a desert sunset and the backyard is a magical green space. In the spring and summer, you will see bunnies! Baby bunnies, grown bunnies, really cute creatures that have learned not to scamper when I pull in with my car. And during summer, fireflies flicker as high as the tallest trees. These are a couple of my favorite things-- that there exists a quiet space in contrast to the craziness that exists from living off of a major intersection. My relationship to my landlords has always been great. Honestly, this is the best landlord situation I’ve ever had. The Nyankori’s are laidback, dependable, and awesome. They are really supportive to the artistic development of this neighborhood, where they also reside. 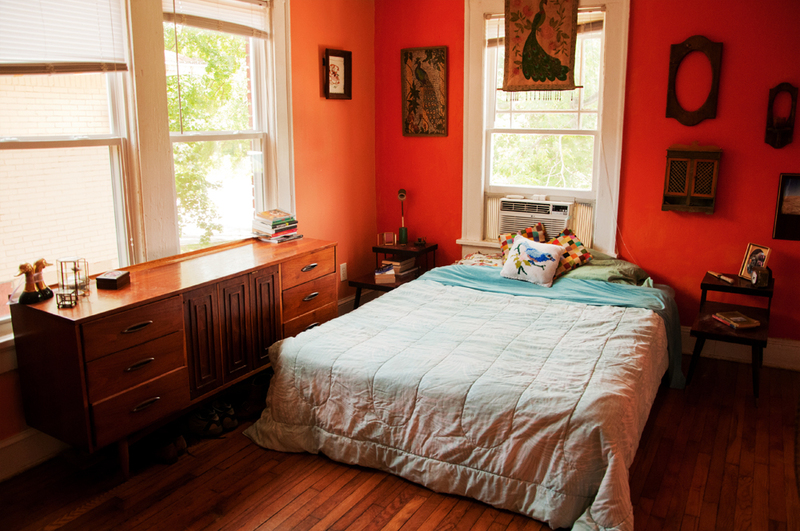 Andre's Metropolitan Apartment bedroom & dining room.Masud: I have really enjoyed living in the Adair Park community. The neighborhood is quiet and family focused. I love being able to wake in the morning and jump right into my studio practice without having to travel outside of my home. 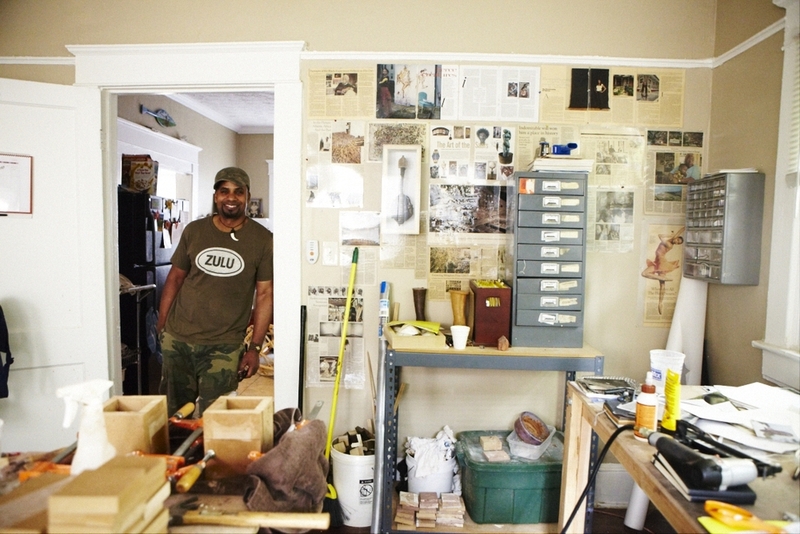 Masud's Elbert House home studio. How & why do you believe the community outreach portion of the program is important to you as an artist and to the community at large. Andre: With regards to the residency-housing program, I think the outreach component helps maintain an aspect of accountability to the artist’s experience and to the program at large. By living in the same neighborhood where I taught, it helped establish more of a direct relationship between my students and myself and to the social themes we tried to document and discuss within the classroom. The reality is, gentrification is too large of a pattern to overcome, but I do think that by working within communities is a great way to help lessen its burden. There is so much about this neighborhood that I have grown to love through living here, that I feel committed to its overall well-being and preservation. Masud: One of the most important aspects of the residency has been the community service component which pairs the artists with children from the surrounding community in arts centered programming. This process engages the residency participants in community development through investment in human potential. 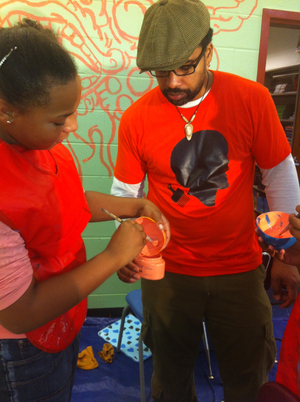 Art as a mechanism for social change is made visible. 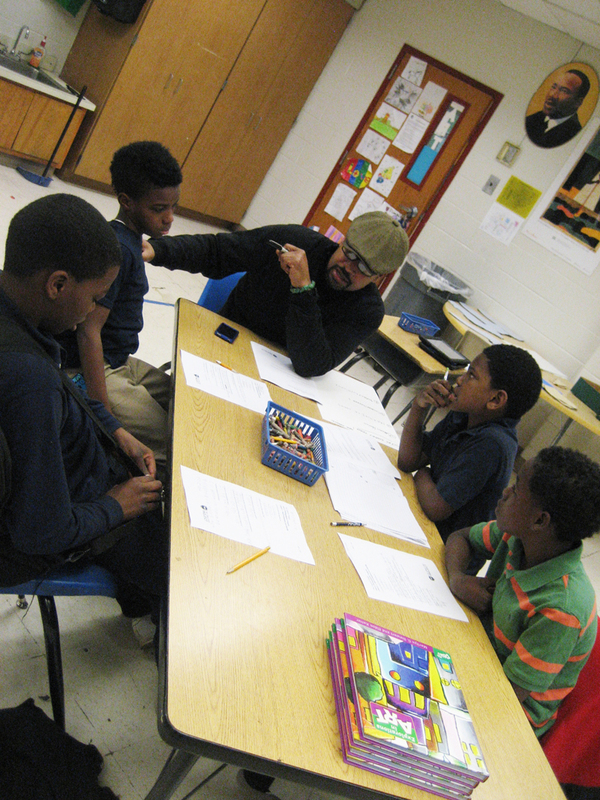 Masud teaching the students of Perkerson Elementary. 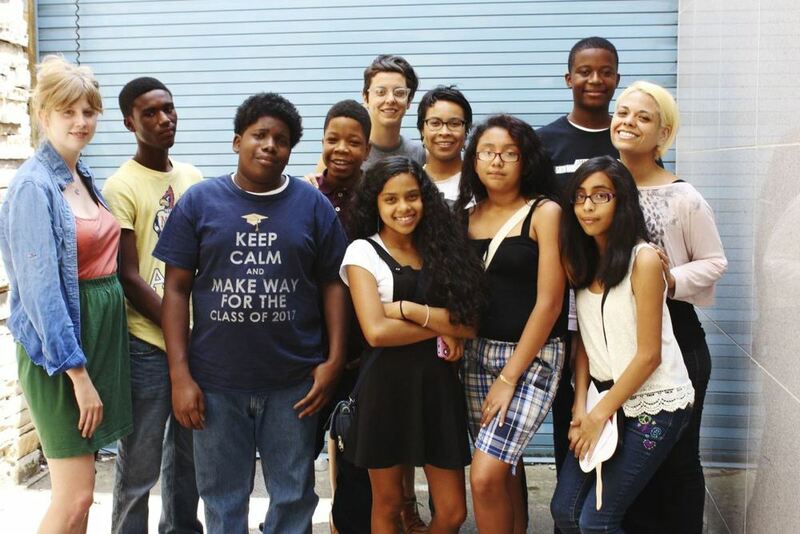 What group of students did you complete your outreach hours with? How do you think you made an impact? What did you learn from working with these children? I was a part of the inauguration of the Capture Project. 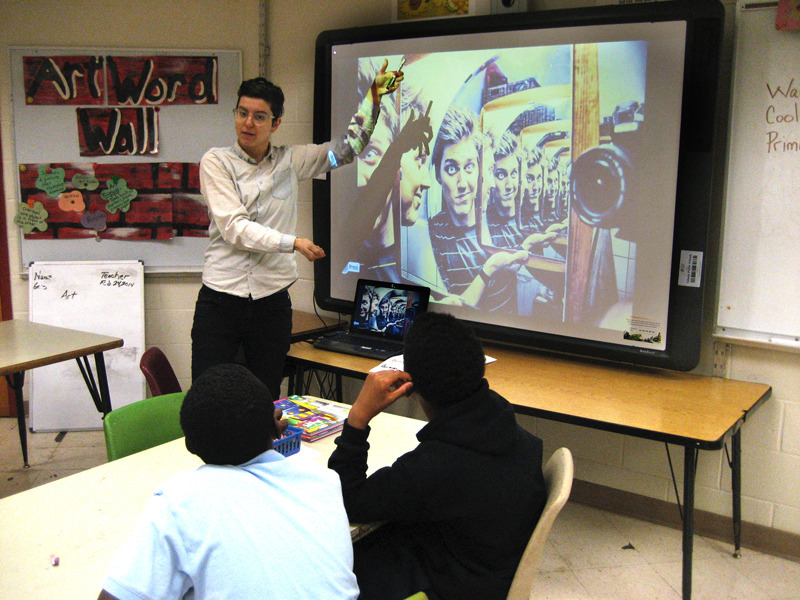 It’s a photo and video-based program, aimed to develop community and documentary practices amongst students. I was one of five artists teaching children at Perkerson Elementary, situated in the community where all residency artists reside. This summer we launched the program in the Old Fourth Ward in partnership with the Year of Boulevard. Andre teaching the students of Perkerson Elementary. In all honesty, it’s sometimes difficult to have a clear understanding of the impact we provided, but I did see our group of students grow in their enthusiasm for taking photos, I saw behavior improve, and witnessed an increase in the accountability of our student towards their actions. We focused on educational strategies that would help to minimize behavioral distractions as we provided them with a structured creative outlet and I could see how important our sessions became to them. That alone made them all the more important to me. The instructors, both individually and collectively, were constantly evaluating and changing our approach to teaching based on our students’ needs. And through that, I better learned the importance flexibility and commitment that is dutifully needed within the educational system especially in Title One schools. Knowing that our students have brilliant minds wasn’t enough; it was trying to figure out ways to keep them individually engaged so they can complete their respective projects. Wanna join the TCP family??? SUBMIT YOU APPLICATIONS BEFORE JULY 12th!